Reality based self defence, is really the wrong phrase to use, the more accurate phrase should be Reality based self PROTECTION. 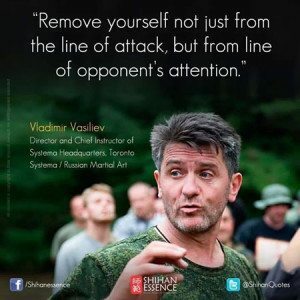 The problem with the word DEFENCE is a psychological one, having a mindset that only thinks of the combat scenario in the form of self defence is to place oneself on the back foot, this makes the practitioner wholly reactive, waiting for an assailant to make the first move. This in point of fact places the assailant in charge and he will always be one step ahead. 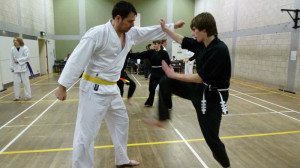 If self defence is replaced with self protection the mindset changes up a gear, the practitioner is no longer waiting working off of the actions of the assailant. Now they become proactive, searching out anything that could alert them to the threat of impending danger. They take charge of the combat situation without the assailant realising someone else is in control. The self defence class is a breeding ground for the blinkered, and reality based self defence is very rarely reality. This is where Systema has the edge on many self defence classes and many martial arts systems. Systema occupies the zone of protection being aware of what an assailant is thinking before the assailant is aware of it them self. It makes no difference where you live London, Dublin, Ireland, Glasgow, Scotland or Exeter in Devon. Acceptance and awareness are the keys. I have become aware of a malaise that runs through many self defence classes, and have termed it “Ferrous testiculus” or “Iron Balls”. This references the common sight of two or more practitioners working on a set self defence technique. The attacker or “Tori” initiates an attack on the defender or “Uki”. Uki will then follow a set sequence of blocks and strikes, unfortunately I have many times witnessed the complete and total disregard to the effect of these blocks and strikes will likely produce. The Tori receives the series of blows; that generally make hardly any contact, and as if they possessed a set of “Iron Balls” just stand there and without moving takes no notice of these blows. This is not reality based self protection, it’s not even reality based self defence. Sir Isaac Newton’s 3rd law of motion states “for every action there is an opposite and equal reaction”. Now this law of motion generally applies to the physical world and the forces that act upon it, well I can guarantee the physical action of a sharp and swift kick between the legs will cause a reaction. It may not be opposite or equal, but a reaction there most certainly will be.